Suitable for indoor and outdoor use, our fabric bunting will brighten up and room, garden or party. ENGLAND FLAG BUNTING. 20 X 12" X 9" PVC FLAGS. Flags quanity: 28pcs. 1 x 33ft / 10M England Flag Bunting. Length: 10M / 33ft. We will be glad to reply and help you to solve any problem. Material: Fabric. We will try our best to solve the problem for you. RUGBY 6 NATIONS BUNTING. WALES - FRANCE - ITALY. ENGLAND - IRELAND - SCOTLAND. Our 10 mtr bunting has 30 flags. Fabric Bunting. All made in England to fantastic quantity. FABRIC TRIANGLE BUNTING. 100% FABRIC. DOUBLE SIDED PRINT. FABRIC FLAGS BUNTING. INTERNATIONAL FLAGS OF THE WORLD. 32 X 9”x 6” FABRIC FLAGS. INCLUDES FLAGS FROM THE FOLLOWING COUNTRIES. PREMIUM QUALITYBUNTING. Panama / Peru / Poland / Portugal / Russia / Saudi Arabia. These will flutter in the breeze adding to the sense of occasion. Note:Flag bunting has rectangular styled pieces whereas on pennant bunting, the pieces are triangular in shape. ENGLAND PAPER FLAG BUNTING - 8FT/10 FLAGS. Crystal Palace. Childrens Sunglasses. Cleveland Cavaliers. Chicago Bulls. Chicago Bears. Buffalo Bills. Brooklyn Nets. Boston Celtics. Our 10 mtr bunting has 30 flags. Fabric Bunting. All made in England to fantastic quantity. Pink and Black. Our 10 mtr bunting has 30 flags. Fabric Bunting. All made in England to fantastic quantity. Purple and Black. The World Cup is nearly here! Support England with a length of England bunting. Printed on to waterproof and tearproof Synthetic paper, it is ideal for indoor or outdoor display. FABRIC BUNTING. ENGLAND FLAG. We will be glad to reply and help you to solve any problem. Color: Red White (as pictures shown). With a wide range, good quality, reasonable prices and stylish designs. 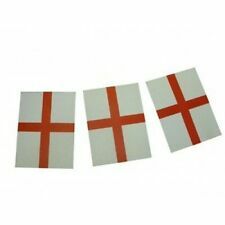 England St George Flag Bunting Party or Event Decoration - 32Ft / 10M Long. Each length of bunting has 20 flags. Length of bunting is approx 32 feet / 10 m long. Can be hung or used as a table fringe. Tau Empire. Amscan International - England Flag Bunting - 7m x 30cm - 992700 Fancy Dress, Party Supplies, Balloons (supplied uninflated). Amscan Fancy Dress. Amscan Pink Flamingo Pinata zoeparrot(19). Value Plastic Bunting. 2 x Great Britain Make Your Own Personalised Banner. Satin Witch. 2 x Great Britain Union Jack Plastic Flag Door Sign. Latex balloons can look very different in colour when flat. ENGLAND - WALES - NORTHERN IRELAND - REP OF IRELAND. FRANCE - ITALY - SPAIN - GERMANY - AUSTRIA. CZECH REPUBLIC - ICELAND - CROATIA - SLOVAKIA. England Single Sided Bunting - 12992/S. 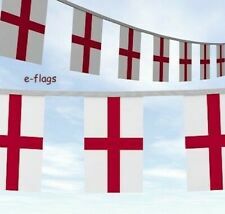 England Single Sided Bunting, is a great way to show. support for the English Sports Teams. Both sides laminated so only place where damp could get in is close to the holes. It should survive all but the most constant downpour. Interesting in a classroom or a playroom. Each flag is 18cm x 13cm the length the extendable. UK includes England, Scotland, Wales, Scottish Highlands and Islands, Northern Ireland, Channel Islands, British Islands. Fancy Dress Worldwide was first founded in March 2016, and has continued to grow as the years go by. ST GEORGE'S CROSS FLAG BUNTING - 22FT LONG! These will flutter in the breeze adding to the sense of occasion. Note:Flag bunting has rectangular styled pieces whereas on pennant bunting, the pieces are triangular in shape. Tau Empire. Amscan Communion Church Pink Holographic Foil Pennant Banner 4m. Amscan Magical Unicorn Deluxe Pull Pinata. Amscan Fancy Dress. Amscan Reindeer Pinata. Amscan Snowman Pinata. Amscan T-Rex Pinata.